The nurse is performing an assessment on a client who has returned from the dialysis unit following hemodialysis. The client is complaining of headache and nausea and is extremely restless. Which of the following is the most appropriate nursing action? 3. Elevate the head of the bed. 4. Medicate the client for nausea. Rationale: Disequilibrium syndrome may be caused by the rapid decreases in the blood urea nitrogen level during hemodialysis. These changes can cause cerebral edema that leads to increased intracranial pressure. The client is exhibiting early signs of disequilibrium syndrome and appropriate treatments with anticonvulsive medications and barbiturates may be necessary to prevent a life-threatening situation. The physician must be notified. A rapid change in the composition of the extracellular fluid occurs during hemodialysis. Solutes are removed from the blood faster than from the cerebrospinal fluid and brain; fluid is pulled into the brain, causing cerebral edema. 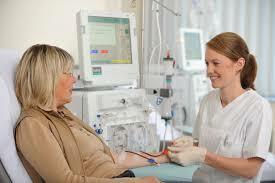 Occurs more frequently in a new client during the initial onset of hemodialysis. Slow or stop the dialysis. Notify the physician if signs of disequilibrium syndrome occur. Prepare to administer intravenous hypertonic saline solution, albumin, or mannitol (Osmitrol) if prescribed. Prepare to dialyze the client for a shorter period of time at reduced flow rates to prevent its occurrence.